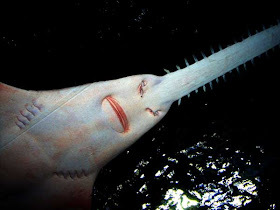 Real Monstrosities: What's the Difference Between a Sawfish and a Sawshark? Sawfish and Sawsharks are actually distantly related. 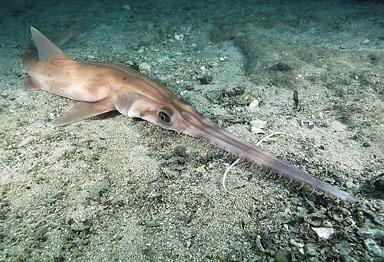 The Sawshark is indeed a shark, while the Sawfish is a ray - still a cartilaginous fish, but not a shark. Nevertheless, they are both flattened, bottom dwelling fish with a big long snout that has teeth sticking out of the sides. Eww! The clearest difference between the two is probably the fact that the Sawshark has a pair of barbels sticking out about halfway along the snout, while the Sawfish has no barbels at all. The Sawshark uses these like a catfish, feeling its way along the ocean floor before it finds something like a fish, crustacean or squid, at which point the violence begins. Another difference is that Sawsharks have their gill slits on the side, like a shark, while the Sawfish has its own on the underside, like a ray. Makes perfect sense! Also, while the saw teeth of the Sawfish are all about the same size, the ones on the Sawshark alternate between long and short. This makes them look just a touch more unkempt and messy, which somehow makes them appear all the more despicable and haphazardly cruel. I guess untidiness is EVIL. And because EVIL never ends, Sawshark saw teeth while rather loosely embedded into the snout, are readily replaced if lost or damaged. Poor old Sawfish on the other hand, with his carefully parted hair and fine, shiny shoes, will have to make do with what he has since the teeth on their saw won't grow back. There are 6 species of Sawshark known thus far, living just off the coast of various countries like South Africa, Australia, Japan and the northwestern Caribbean. The biggest reach 1.7 metres (5.6 ft) long. Most live in fairly shallow depths, although one can reach almost 950 metres deep. Sawfish get much bigger than their shark counterparts. The smallest one can reach 1.4 metres (4.6 ft) in length, the largest about 7 m (23 ft). Between those two are 5 more species, giving a total of 7. They are much more widespread than Sawsharks and it looks like a lot more is written about them, more pictures taken of them and more aquariums look after them. In other words, it's probably a Sawfish. I guess it's something to do with the carefully parted hair and fine, shiny shoes. Aside from aquariums, they live in muddy, coastal areas of the Atlantic and Indo-Pacific Oceans, although they can also move right up into rivers and big lakes. Very few fish can survive in both fresh and seawater, so that's quite a skill. Or perhaps a necessity. Sawfish have pretty bad eyesight, they are nocturnal and live in muddy water so great eyesight wouldn't actually help much. Without the barbels that the Sawshark has, Sawfish have much more of their senses on their sticky-out snout. A bit like the Goblin Shark, actually. Pores on that saw, or rostrum, allow them to sense motion and the electric fields of living nerve cells and their accompanying flesh, what the Sawfish likes to call "food". The saw can then be used to dig up crustaceans and so on to beat about the head and eat. All Sawfish are critically endangered. Some are accidentally caught as bycatch, others are hunted for their snout, fins or liver oil. Then, of course, there's habitat destruction. There's always habitat destruction. Not much is known about their reproduction, but at least some of them are known to take 10 or more years to reach sexual maturity. This is a lot longer than most fish, so they can't recover their numbers as quickly as others. Captive breeding has only been successful once, with one species, and it's thought that it may require some sort of transition between freshwater and seawater but further research is required. I certainly hope we don't lose the Sawfish. Now that we have 2 amazing saws I couldn't imagine a world with just one. I hope we will at least know which one we're looking at from now on! Hahaha! If only they would! These are the ones my kids used to see in cartoons. They would be used to saw a piece of wood or something. Haha, yeh! I remember scenes like that! I wonder if cartoons still do that kind of stuff? If things get really bad, your old buddy the Swordfish is here for you. Ha! It's crazy how these fish can have tools and weaponry sprouting out their face! Great article, and over all website! This post was perfect for me to link to for a part of an article I'm writing. Hey! I'm glad I could help! One is scary evil and a murderer and the other is a shark. Ha! I guess that's one way of summing it up! I would HATE to be at the wrong end of an angry sawfish. Your limbs might not survive!